Making stuffed animals for John and Caroline Kennedy. The cover photo of the May 1962 issue of McCall's magazine shows a smiling first lady Jacqueline Kennedy posing with her two young children, Caroline and John Jr. In Caroline's lap is a small stuffed animal—a blue elephant. That toy was made by the Mary Meyer Manufacturing Company, which is still in business today. Its stuffed animals and other toys are sold by department stores, hospital gift shops, and catalog merchants like L.L. Bean. 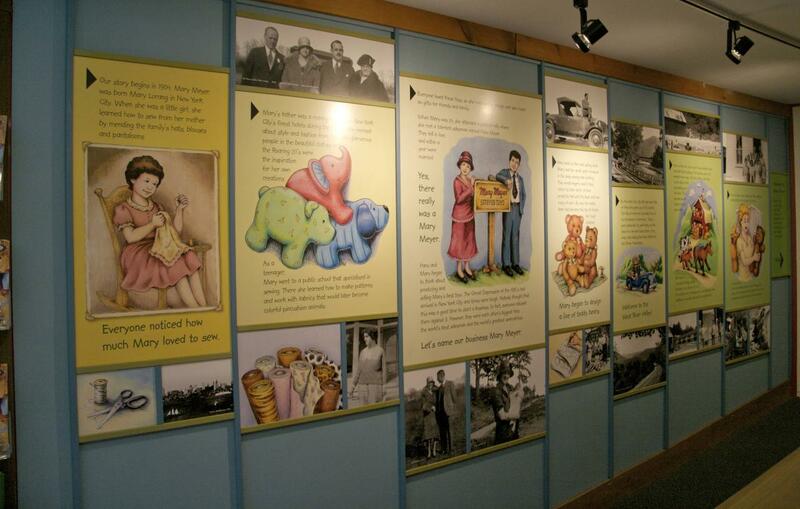 At the company's small headquarters in Townshend, Vermont, a wall display outlines the firm's history. 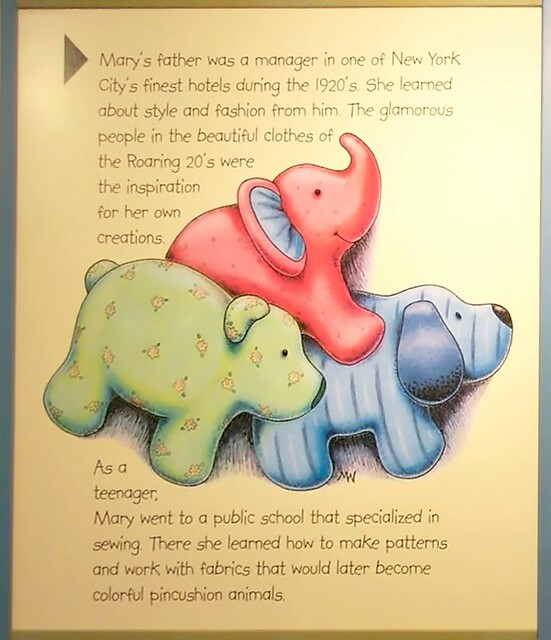 The second panel in the display mentions that company founder Mary Meyer "went to a public school that specialized in sewing." That school was the Manhattan Trade School for Girls. But Mary wasn't yet known as Mary Meyer in those days. She was Mary Lorang, a girl born to German parents who'd settled in New York. Her route from Manhattan Trade to the cover of McCall's was a long and improbable one, and is one of the most fascinating success stories to emerge from my collection of Manhattan Trade report cards. Mary is no longer alive, but her company is still owned and run by her family. Earlier this year I drove up to Vermont to meet her son, Walter Meyer, who ran the company after Mary retired (now 80 years old, he still serves as a consultant and overstock salesman), and Walter's son Steven Meyer, who runs the company's design department. They showed me around the little company museum they'd recently set up. The McCall's cover is displayed there, along with assorted old toys from the Mary Meyer product line. "We had saved some of them, and we've also been finding a lot of them on eBay," said Steven. "Frankly, they don't sell for a whole lot, so if we see something of ours, we buy it. It's a great way for us to reclaim our own history." Mary's report card doesn't have a photograph, but Walter provided a shot of her when she was 18. According to her employment record, she was working for a dressmaker named J. Carroll at that time. Walter recognized this name right away. "She talked quite a bit about Miss Carroll," he said. "They made expensive dresses for wealthy clients, including the women from the Otis Elevator family. She went in there originally as a sewer, but then she became a buyer." It was while working for Miss Carroll that Mary met a German immigrant named Hans Meyer, whom she married in 1929 (here they are the following year, and here's Mary holding a very young Walter shortly after his birth in 1931). Around the time they were married, Hans went into business with Mary's brother. "They were importing Chinaware and porcelain items from Germany," explained Walter. "Figurines, little horses, things like that. But there was a boycott of German products after Hitler came in, and that put them out of business. So in 1933 my mother and father decided to combine her skills as a seamstress and his skills as a salesman to start a new company selling pincushions." You may recall your mother or grandmother using a tomato pincushion. Prior to World War II, however, pincushions were commonly shaped like animals, and this is what Hans and Mary's new company made—little stuffed cushions that looked like miniature animals. They named their new venture the Mary Meyer Manufacturing Company. It's not clear if they showcased Mary's name to appeal to their primarily female customer base, or perhaps as a way of avoiding any anti-German sentiment that might have been aroused by Hans' first name. In any case, a mom-and-pop company named after the mom seems like a fairly progressive move for 1933. Mary and Hans set up shop on West 29th Street in Manhattan. With Mary using the patternmaking skills she'd learned at Manhattan Trade and honed in the couture world, the company was a quick success. "She was a maker who loved to make, and he was a salesman who loved to sell, so they were a great fit," said Walter. "She told me they had 108 girls working for them in those days." One of those girls may have been hired as the result of a remarkable phone call Mary made on Oct. 15, 1936. That's the date of the final entry in her Manhattan Trade employment record, which reads, "Mary Meyer Mfg. Co. Business for self. Called here for girl." In this simple entry we can see many of the things that made the Manhattan Trade School for Girls so special. There's the lasting connection between school and pupil (by this time it had been 15 years since Mary had completed her vocational training and 12 years since she'd last secured a job through the placement office), the meticulous documentation of every communiqué, and the obvious high regard that the students had for the school. In a Depression-ravaged employment market teeming with job applicants, Mary knew where to find a capable worker: at the same school that had trained her. Her relationship with Manhattan Trade had come full circle. Unfortunately, there's no indication of whether the school actually sent a student to work for Mary. The answer may be lurking in another student's work record; if so, however, that student's file isn't part of my collection. (Believe me, I looked.) And Walter and Steven said the company didn't have employment records going back to 1936, so we'll never know for sure. But even if the school didn't supply Mary with an employee, the mere fact that she asked them to do so feels like a validation of Manhattan Trade and its mission. "Called here for girl"—it's my favorite entry, my favorite detail, in the entire report card collection. As for Mary and Hans, they eventually grew tired of New York. In 1944 they moved to Vermont, where Hans made a brief, unsuccessful attempt at farming. Mary had been hand-sewing a few toys during this period ("The step between an animal pincushion and a toy is not that large," noted Walter), so she and Hans decided to sell the farm and revive their old business, this time as a toy company. Once again, their complementary skill sets made for a successful combination. Helped along by innovative designs like the Pajama Pooch—a stuffed dog with a zippered compartment where kids could keep their pajamas, which was a hit for the company in the 1950s—they established a name for themselves in the toy industry. They weren't directly involved in that McCall's cover shoot—no stylist contacted them, and they certainly didn't have any connections to the White House—but they recognized their product when they saw it there. It was a proud moment for them. Hans died in 1965, but Mary kept designing toys until 1982. Even after retiring, she remained a frequent presence in the Mary Meyer factory store, where she'd talk to customers and autograph the tags on the toys they purchased. She died in 1999, three years after I found the report cards. If I had met her while she was still alive, the first thing I asked her would have been, "So did the school end up sending any students to work for you?" Perhaps she wouldn't have remembered. But I really wish I'd gotten the chance to find out. I don't have any of my own report cards. I remember a few of them floating around in a desk at my parents' house, but they must have been tossed out when that house was sold. When I think back on them, only two things come to mind. One is a note from my first grade teacher, Mrs. Smith, who wrote, "Paul continues to be a fine student. But he needs to learn to control his talking, as it sometimes disturbs others." (This has proven to be somewhat prophetic.) I also recall being disappointed when my elementary school stopped including a line for "shows initiative" on our report cards, because I had always received high grades for that. I had no idea what "initiative" meant. I just knew it was something I was apparently good at, and now I would no longer get credit for it. I'm sure my student record, like most people's, has its share of high and low points, including plenty of things I've banished to the furthest recesses of my brain and would rather not be reminded of. I've thought about that a lot while pursuing this project. Even if I could find a living student from my report card collection, would she want to see this document from her past? Was it selfish of me to ask someone to relive intimate and potentially awkward moments from her adolescence? If somebody out there somehow obtained my student record, would I want to see it? Even if I did, how would I feel knowing that this other person—a total stranger—had pored over it? In August of 2010, nearly 14 years after I discovered the Manhattan Trade School for Girls report cards, two friends and I took a road trip to Detroit, where we planned to spend several days exploring abandoned buildings. We were primarily interested in old industrial sites, but someone we met along the way suggested that we check out a shuttered school called Cass Tech. The building had opened in 1922 and closed in 2005, when the school moved to a new facility. According to the website Buildings of Detroit, "When the school moved into its new home, almost everything was left behind, from desks to school supplies to televisions mounted on the walls." Most of those materials had been stripped bare by the time we got to the old school (which we entered simply by opening the main door—it was unlocked). But there were still some beakers and other glassware in the chemistry labs, a beautiful old chair in the art studio, and a few other items of interest. In the auditorium I discovered a work order, apparently never acted upon, for one of the stage light switches, and for some reason this struck me as terribly poignant, as if the damaged switch was still patiently awaiting the repairman who was never to arrive. There was a seemingly endless series of junked classrooms. While making my way through one of them, I came upon the remains of an administrative office. In the corner was a file cabinet, which I instinctively opened. And that's where I found—of course—some report cards. It was a much smaller stash than the one I'd found back in 1996. Just six large envelopes—each with a student's name on it—with lots of report cards and other paperwork inside. Still, the parallels were inescapable. Once again, I knew I couldn't leave these documents to rot. I tucked the envelopes into my satchel and realized I'd probably just become America's foremost —only? 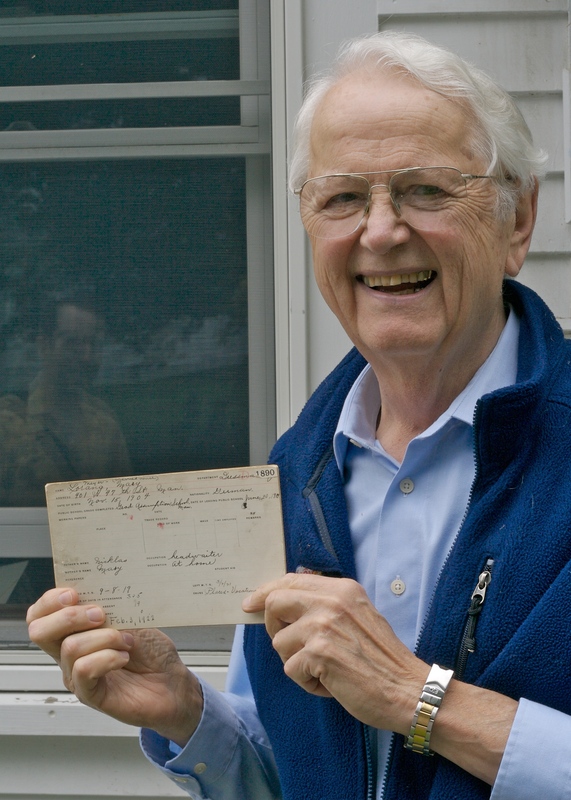 —collector of discarded report cards harvested from old file cabinets. A few days later, I sat down with the Cass Tech student records. They weren't as compelling as the Manhattan Trade cards—no photos, no commentary from teachers, no letters from parents, no employment records, no storylines to follow. It was mainly just grades, addresses, and a few immunization records. It was hard to get a sense of who these students had been. One file, however, included a questionnaire that the student had filled out in fifth grade, and this was full of choice morsels. One of the questions was, "If you could choose, what is the kind of vacation you would like to have next year?" The student's answer, rendered in endearingly awkward grade school script, was, "I want to go to Baltimore," which I found both adorable and a bit sad. What had been in Baltimore—a favorite uncle? A friend who'd moved away? The family's previous home? Just as I'd done with the Manhattan Trade cards, I found myself getting sucked into this unfinished narrative. The student who filled out that questionnaire was a boy named Carmen Fanzone. He was born in 1941 and had attended Cass Tech in the 1950s. In fact, all six of the Cass Tech files were from the 1950s, and four of them were for boys, which meant the students were probably still alive and wouldn't be too hard to track down. But only Carmen Fanzone's file had the questionnaire, so he's the one I was most interested in finding. There was also something very familiar about his name, but I couldn't place it. I located Carmen a few months later. I sent an e-mail and then left a voice mail, but there was no response. I let some time go by and tried again—still nothing. I began to think maybe it wasn't meant to be. Inside, a small part of me was secretly relieved. Meanwhile, in March of this year, demolition work started at Cass Tech. If any additional report cards had been in there, they were now gone for good. About two months ago, after several rounds of phone tag, a misspelled e-mail address, and some procrastination, I finally found myself on the phone with Carmen Fanzone. By that time I had completed all the other interviews for this project. Carmen was the final piece. But speaking to him felt like a new chapter, not an epilogue, because it marked the first time I'd been able to connect a report card to a living student. That was exciting, but it also made me a bit nervous. I asked Carmen how he felt about all this. Did he feel his privacy was being violated? "No, not really," he said. "It is a little weird that you were able to salvage this stuff, though. The fact that it was accessible kind of blows me away, especially since everyone's so obsessed with shredding now. But it's nothing I'm ashamed of, or proud of either. It's just something from when I was very young." "Music always came easily to me," Carmen said. "I'd been playing the trumpet since I was 8 years old, and Cass Tech was known as one of the top music schools in the country, so I was very proud to go there." He also starred on the Cass baseball team, which played for the Detroit city championship at Tiger Stadium in 1959. Carmen was happy to talk about his time at Cass, at least in general terms. But if I asked about any of the specific items in his student file—all of which I'd e-mailed to him a few weeks earlier—he'd say, "Hmmm, I must have missed that" or "I didn't look too closely at that, frankly." It was clear that he hadn't spent much time looking at this material. I asked him why. "Well, when I think of high school, and when I think of report cards, the first thing that comes back is that I flunked economics in the 12th grade and couldn't graduate with my class," he said. "I had to go to summer school. Education was very important to my dad, and he was so disappointed in me that he didn't talk to me that whole summer, until I graduated after summer school." This episode clearly stung, even 50 years after the fact. "It's OK," he said. "I can talk about it pretty easily with people now, but I still get tearful"—his voice quavered—"just like I'm doing now." Throughout this project, I had worried about dredging up painful memories. Now I had literally made a grown man cry. I felt terrible. A little voice in my head said, There, are you satisfied? I apologized, but Carmen said not to worry about it. We moved on to happier topics, like Carmen's wife (jazz vocalist Sue Raney, whose records he's played on), how the Cubs were the ideal team for him to play for ("Wrigley Field didn't have lights yet, so we only played day games, and then I'd sit in at the jazz clubs at night"), and his continuing devotion to music and baseball (he gets to work 40 minutes early every day so he can practice on his trumpet, and he participates in a Cubs fantasy camp every winter). We also talked about an amusing quirk regarding his birthday's connection to his baseball career—for details, click here. As we wrapped up, I thanked Carmen for his forthrightness, and he reassured me that I hadn't overstepped any boundaries. "This has been interesting, Paul. It's a step back in time, and a chance to think about some old things I hadn't thought about in a while." Then I heard myself saying something—something I'd been waiting to say for nearly 15 years without even realizing it. "This student record I have here, it's a piece of your life. It belongs to you, not me. Would you like me to send it to you?" Carmen's voice brightened. "Oh, would you please? I'd really appreciate that. Thanks." A great many people contributed to the Permanent Record project. For a full list of credits, click here.